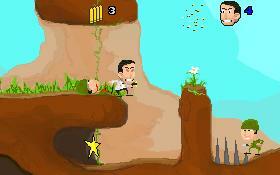 A small one level multi scrolling platform game based on 2ma2`s platformius...game. "A really great platform style game. Beautiful colors and graphics. Game play was quite difficult at first but got easier the more I played it. You could not see enemies when you jump and could easily drop straight into one causing you to die and you go back to the beginning. The jumping animation was superb. You start with 4 lives. The game has no saves and I found this slightly frustrating. The exit yes/no gui could have been prettied up as it is the default grey colors. No bugs found. I would liked to see a longer version as this game was quite short in length. Seeing as this game was made in 2004 I think the author did a good job. I liked this game and I thought it just fell short of 4 cups.. "
A lovely game, well worth the download. I had great fun playing this game.Good Work! It reminds me of those old Sonic & Knuckles games I used to play... excellent game. This is an excellent game... real fun, even if it isn't complete yet.